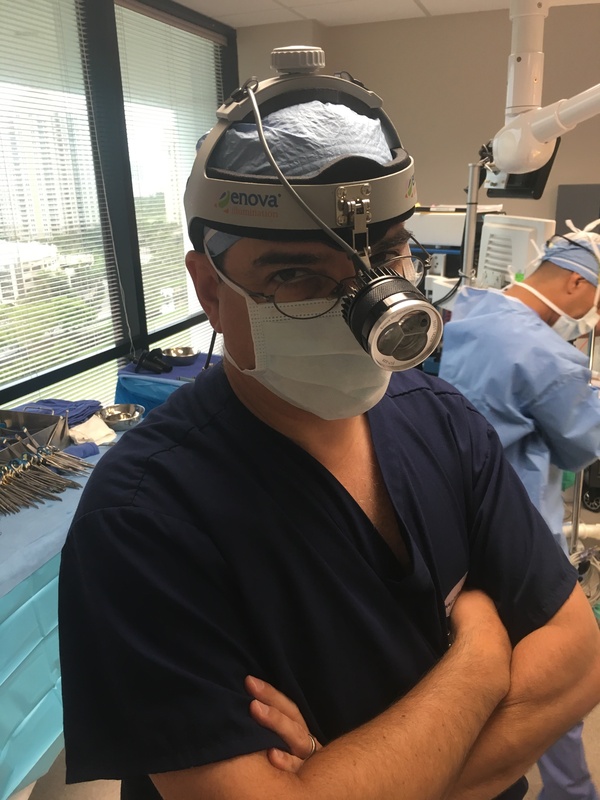 This month Shedding Light connected with Adam J. Rubinstein, MD, FACS to discuss his plastic surgery practice in Miami, Florida, and to learn more about his experience using his Enova Cyclops XLT-225 surgical headlight. Dr. Rubinstein: I help patients look and feel better from head to toe! My practice offers both surgical and non-surgical solutions to patients who have been unable to achieve the change they desire with diet or exercise. I also work with patients who suffer from birth defects or injuries. The types of plastic surgery I perform include breast enhancement, body contouring, facial surgery, laser resurfacing, reconstructive surgery as well as minimally invasive or noninvasive procedures such as chemical peels, light and laser treatments, cellulite treatment, dermal fillers and injectables and other MedSpa services. I’ve been a doctor for 20+ years and a plastic surgeon for 14 years. We have an operating room on the premises that has the most modern monitoring and safety equipment available. I also perform surgeries at Jackson North Medical Center, where I am Chief of Plastic Surgery and Vice Chief of the Department of Surgery. I’m board-certified by the American Board of Plastic Surgery and am also a clinical assistant professor in the Department of Surgery at NOVA Southeastern University, on clinical faculty for the Department of Plastic Surgery at Florida International University School of Medicine, and voluntary clinical faculty for the Cleveland Clinic Plastic Surgery Residency Program in Florida. Dr. Rubinstein: I’ve always tried to maintain the highest quality of service and care to my patients and have been fortunate to have a loyal patient base. I’ve earned a good reputation and have gotten busier over the years. From a technological perspective—and there are always new things on the horizon—I like to stay on top of the latest technology, especially when it allows for better outcomes and faster patient recovery. Dr. Rubinstein: Lighting is key during surgery; if you can’t see, you can’t operate. No surgeon is ever happy with just the overhead light in the OR. The quality of the headlight lighting is directly related to how well I can perform surgery. Dr. Rubinstein: I first saw Enova at an ASAPS (American Society for Aesthetic Plastic Surgery) tradeshow. I’d eyed getting new equipment but the timing had to be right. I’ve used fiber optic surgical headlights but never liked being tethered to a power source and I’d tried another cordless headlight but it was larger and heavier. When I saw the XLT-125 and XLT-225, I wasn’t sure which one I’d prefer. Enova graciously let me evaluate both of them. I chose the XLT-225 and am very happy with it. The light is bright—as good as any LED surgical light out there—and it is incredibly comfortable. I’m able to easily step back from a bilateral breast surgical procedure without being pulled by the power cord and changing the setting on the battery pack can be done right through my surgical gown. Dr. Rubinstein: I use my XLT-225 two to three times each week and can be in surgery from one hour up to five or six hours. The batteries are long-lasting and I have two, so I don’t worry about running out of power during a procedure. Recharging the batteries is simple and I found that they don’t need charging after a shorter procedure and will be ready when I need the headlight next. I use my headlight in the OR in our offices and at the hospital; I take it with me. Shedding Light: What do you like best about your Enova XLT-225 headlight? Dr. Rubinstein: There isn’t just one thing to like. I like how lightweight and comfortable the headlight is and how portable it is. I can move freely around the patient during surgery while wearing the XLT-225. You really can’t account for how comfortable this headlight is until you’ve tried it. I can’t imagine using a fiber optic headlight now. Dr. Rubinstein: I do. Most often other surgeons will see me wearing the headlight and be curious. I don’t hesitate to recommend the XLT-225!